Photos of packaging and card leak. Previously we saw evidence of Asus and PowerColor cards. Wow...To each its own but...that is some kind of ugly. Why doesn't the box match with the card colors so you get an idea of what's in it...?! Yeah, it's pretty "unique". It's a shame, really. The black shrouding looks pretty good and (from what I've read) is pretty effective, as far as coolers go. 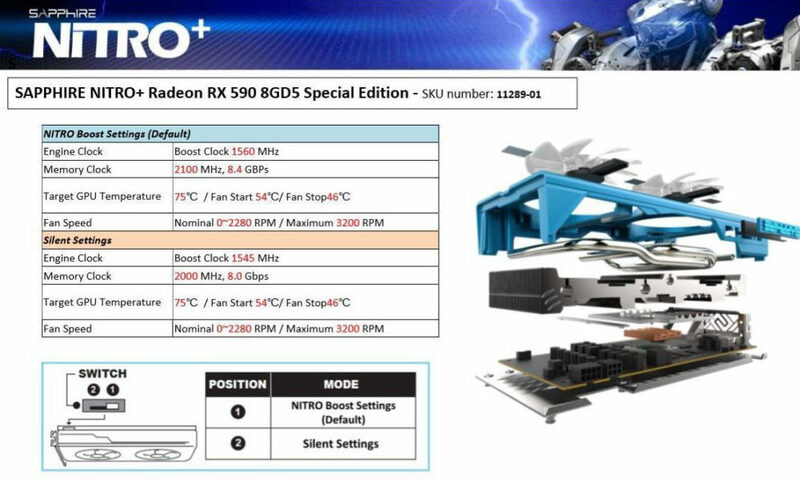 I prefer the normal nitro cards with the black cover, looking for a cheap second rx580 which I am sure the RX590 will help with. I guess, if my case had no window this could work; but then again, why make it any color in that case...? Am I the only one on this forum who thinks the colour is kinda cool? In a way i actually like the colour but can't imagine it working with the colour scheme of 99% of desktops. So the only difference between this and a 580 is the clock speed is boosted to 1500 MHz? Blue or Black I think it looks quite good. The £236 + VAT looks a bit much though. A 12nm RX 580 for nearly £300.. So the only difference between this and a 580 is the clock speed is boosted to 1500 MHz? Not quite. It has new 12nm silicon to allow it to hit that frequency without glowing like a star, so there might even be some overclocking headroom on top of that. This will go quite nicely with my pink case and my lime green keyboard.